Nearest I can tell, you download and burn the ISO, it performs some sort of voodoo, then you insert the Mac OS X DVD and install like normal. So if you’re even remotely interested in this I’d say to download it right now because Apple’s lawyers will be all over this within a matter of seconds. You can count on that. Update: Psystar’s site is down but here are the installation instructions if you managed to grab the trial version in time. Anyone get it to work yet? 1. 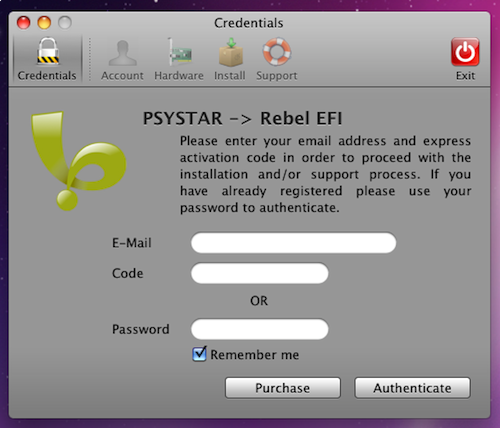 Download the Rebel EFI file, available here. 2. Burn the file to a CD. 3. Insert the Rebel EFI disc into your CD drive. 4. Start or restart your computer. **Boot Options or Boot Menu Key differ by motherboard manufacturer. 11. Click Continue, if you want to continue with the installation of Snow Leopard. 12. Click Agree, if you agree. 13. Select the disk that you want to install Snow Leopard on. a. If no disk shows, Click on Utilities on the tool bar, then select Disk Utilities. b. On the left you should see your hard drive. c.	If not, a disk is not connected or cannot be read by your computer. d.	After selecting your hard drive click on Partition. e.	Under Volume Scheme, click current and select 1 partition. f. Under Volume Information, name your hard drive. h.	At the bottom of the window Click on the Options Button. 14. Select the disk that you want to install Snow Leopard on. 22. Press Enter to boot Hard drive. 23. Launch the Rebel EFI application from the CD. 24. Follow the on-screen authentication procedure. 28. Select, Do not transfer my information now.